I have to thank Beth, who blogs at Cooking Up Quilts, for nominating me for the One Lovely Blog award. I'm not sure where the award started, but it's a lovely way to honour those who write the blogs we love. 1. I'm not very good at small talk with people I don't know well. I tend to just smile a lot and let others do the talking when I'm in big groups. I'm much better if I know I have something in common with the people around me, like if they're quilters, but other than that I'm pretty hopeless. All bets are off once I get to know you, though...I can talk a lot with people I know well! 2. 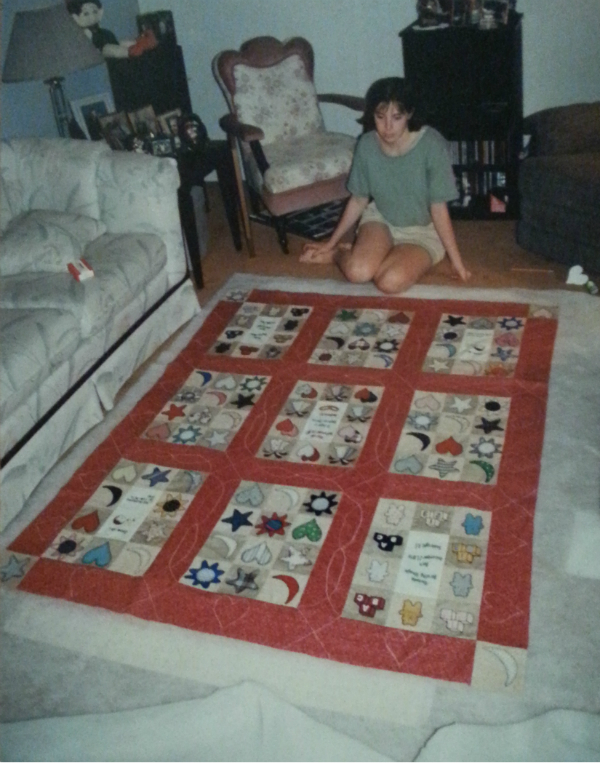 I made my first quilt during my second year of university (that was 1997) as a wedding gift for my friend Michelle. My mother, who had made one quilt herself, taught me what to do and I just dove in. The quilt had hand embroidery, fusible applique and hand quilting. I haven't looked back since! Here I am getting ready to baste my first quilt. The white lines in the sashing and borders mark where I planned to quilt. 4. I eat semi-sweet chocolate chips by the handful. Sometimes (okay, rather more often than sometimes) I just want a hit of pure chocolate and this works perfectly. I blame my husband for introducing me to the idea years ago, but I have certainly latched onto it. This would be why I have taken up running! 5. I have wanted to be a published writing for as long as I can remember. 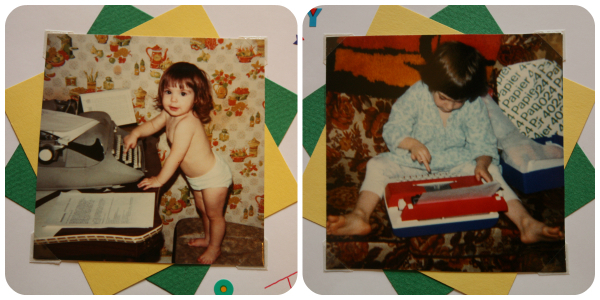 Mom says I was about 4 when I told her I'd be a writer when I grow up. What I want to write has changed over the years. As a teenager I was convinced I'd write epic fantasy novels, like Tolkein or Robert Jordan. In university I wrote a children's fantasy novella as my honours thesis. I went through a lot of years when I didn't write much of anything, though the dream was always there. For now, I'm happy with writing a quilting blog with weekly devotions. 7. In high school, chocolate chip cookies were my specialty. Whenever my friends and I got together, I was responsible for bringing my cookies. Once, though, I put a batch of cookies in the oven and went to rhythmics practice. Thankfully Dad was home and realized what had happened when he started to smell something burning. He arranged them nicely on a platter, took a picture and left them for me to 'enjoy' when I got home! In accepting this award, I also agree to pay it forward and nominate other blogs that I feel are worthy of the award, (though the nit-picky writer in me has to say that I'm not actually nominating them for it, but rather simply awarding them with it), so here is a list of other blogs you should certainly check out. Stitchery Dickory Dock - Amy's blog was the first one I ever read, back in 2012 when she was teaching the free Craftsy Block of the Month class. Her blog is beautiful. She shares her gorgeous quilts and snippets of her life as mom to 4 little ones, and she has a book coming out soon that I can't wait to see. Once I discovered her blog, it wasn't long before I was following along, reading every post, and then through Amy I found my way to the rest of the quilt blogging community and eventually started my own blog. So, I hold Amy somewhat responsible for all the fun I'm having now that I'm part of this great community of quilters. Quilts of a Feather - I've spoken about Renee and her lovely blog before, when I shared the quilt I made for her, but it bears repeating. 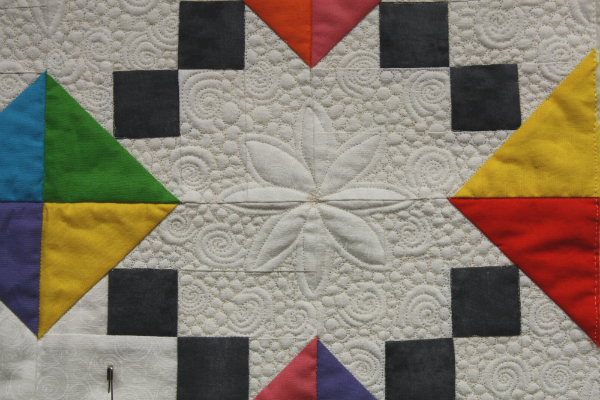 Her free motion quilting skills are amazing, and her quilts are beautiful! Hidden Ponies - Anna is a food blogger and mom of 4 who writes beautiful and entertaining posts about food, her family and life in general. Celtic Thistle Stitches - Fiona writes a somewhat eclectic blog. She hosts a couple of linky parties each month, quilts and does other crafty things and travels quite a bit (and shares the pictures to keep the rest of us dreaming about world travel). You never quite know what she'll be sharing, but it's always interesting! While She Naps - Abby shares a great mix of posts about crafting, blogging and the business end of running a creative business. She also digs into the nitty-gritty of the crafting world, looking into things like how much money fabric designers make from each collection. Her newsletter is always interesting too. There are many more blogs I enjoy reading, but it seems most of them have already been nominated for this award, so I'm limiting myself to only 5. Thank you again, Beth, for nominating me! I love getting to see the first quilt you worked on - how awesome that you have a photograph of you working on it! :) I also have been known to each chocolate chips like that... glad I'm not the only one! Ah, we have so much in common! I keep a bag of chocolate chips around just so I can dig in when I need that pure chocolate hit; I wrote a children's story book in college; and I too tend to be quiet in a group of people. I love that you have so many great pictures of you doing what you love - that picture of you with your first quilt is fantastic! I love your blog Leanne, and I'm excited to check out the blogs you listed. There are some there I haven't heard of. Thanks so much for including me in your list, even though I don't quilt :) Aside from that and the rhythmic gymnastics (so cool! ), I could have written this list - we have so much in common! I loved reading this, and think blogging is a great way to stay ready for the day you're set to become a published writer - you can do it! My MIL used to give out little handfuls of chocolate chips from "the chocolate chip fairy". 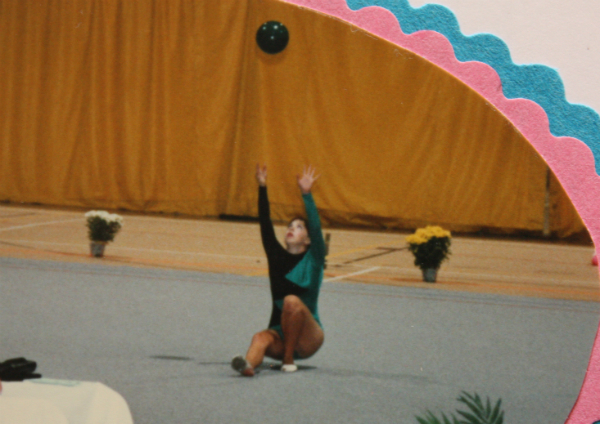 How fun you used to do rhythmic gymnastics! I always loved watching it during the olympics. Amen to handfuls of chocolate chips! Yum! Stitchery Dickory Dock was one of the first blogs I followed too! I look forward to all her posts. Round Trip Quilts - Second Last Round!